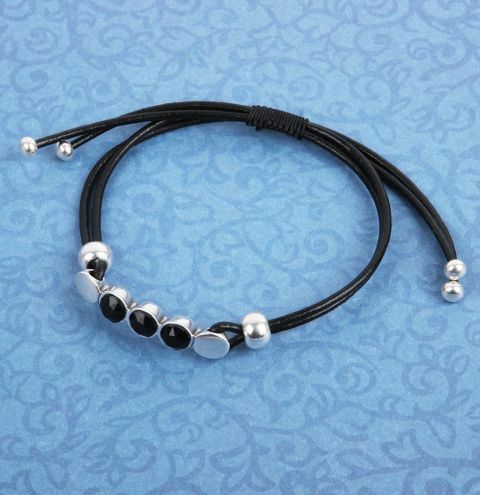 Make your own Jet Glamour Bracelet using Swarovski chaton crystals, matching leather cord and shining silver findings! Cut two lengths of leather cord measuring approx. 40cm each. You can make these shorter to change the size of your bracelet later. Thread one of these cords through one side of the 3 crystal connector bar to the halfway point of the leather. Do the same with the other cord on the other end. Choose one end of the connector bar. Thread a large silver slider bead onto the two halves of cord threading through this hole. This will bring them together. Repeat this with the other cord through the other side of the connector bar. Next you will complete a series of 'macrame knots' to make a sliding clasp. Follow this short tutorial to learn how to make macrame knots HERE. Take the two cords on one side of your bracelet and pin them to your work surface. Pin the other two cords in the opposite direction (as shown in the image) to make the circle shape of the bracelet. Cut approx. 40cm of satin beading cord. Thread this under the section where the 4 leather cords sit next to each other (where the arrow is pointing in the last image). Make approx 2cm of knots using your satin beading cord over this section. Make sure the knots aren't too tight. Follow the video from step 4 or follow the simple diagram image here. Secure the ends of the knotting cord with a drop of glue, being careful not to glue the sliding knot to the centre cords running through it (otherwise it will not be able to slide and adjust). Try gently pulling the centre cords through the sliding knot while the glue dries. Decide how big you need your bracelet to be able to open, and trim the 4 ends of cord down to size, allowing some space to open the bracelet to put it over your hand. Add another couple of centimetres if you are unsure of your final measurement. Glue an end cap onto each of the 4 cords and wait for these to dry. Finally, glue your crystals into the connector bar and allow these to dry before wearing.